Note: Several petitioners filed multiple petitions. California, Florida, and Texas clearly lead the pack in terms of companies authorized by the FAA to conduct commercial UAV operations. New Hampshire and DC both have zero authorized companies. 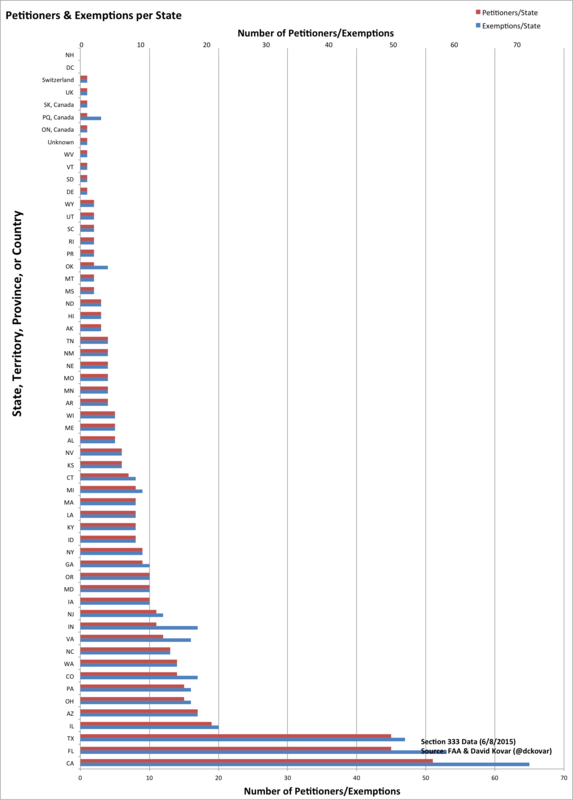 The full chart is at the bottom of this post. *June 2014 Includes 2 exemptions which skew the average high: Yamaha at 322 days, Amazon at 270. **April submissions only include those for which exemptions were granted on or before June 8, 2015. 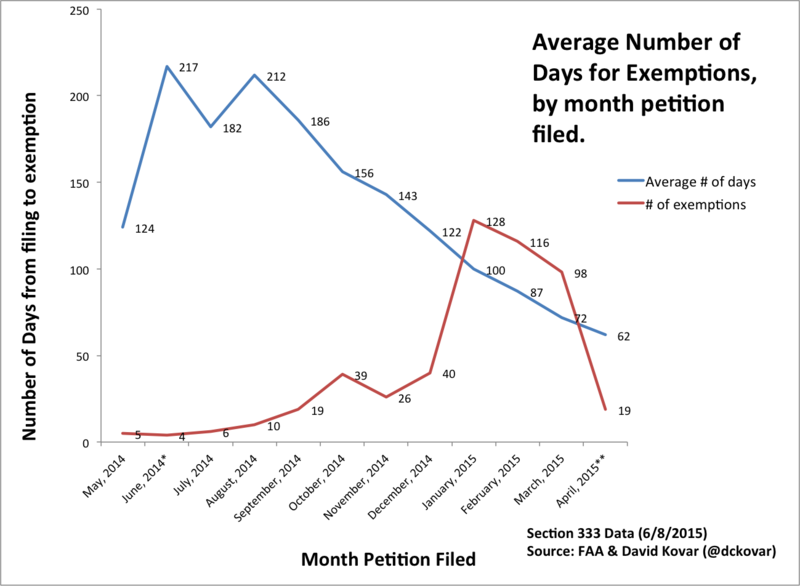 Not only are we seeing more exemptions get filed, we’re seeing the exemptions in the queue get processed faster. Clearly a good thing for those who want to go the 333 route. All too often we hear that “UAVs are only used for photography,” usually referring to media, real estate, and filmmaking. 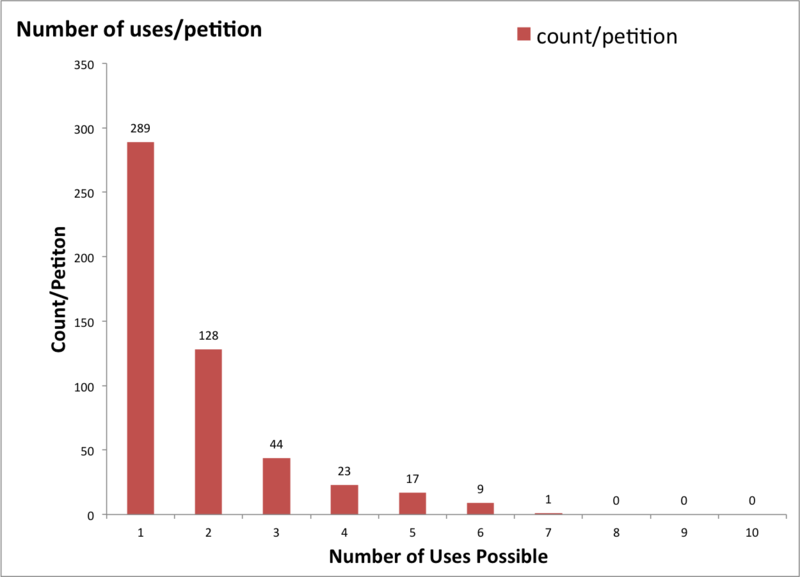 The data shows that petitioners are interested in using UAVs for many other purposes. “Filmmaking” includes not only motion picture industry movie-making, but also private event filming, newsgathering, business/tourism, etc. “Real Estate Photography” is frequently described formulaically as “academic community awareness” (so people know where to find Main Street, actually, not “academic” in the sense of teaching). “Precision Agriculture” almost invariably is accompanied by “Survey/Mapping/GPS” use as well. “Industrial Safety (Inspections)” was inclined towards both specific inspection objectives, such as bridges and flare stacks, and industrial activities which require industrial safety, such as mining, construction, civil engineering projects, public utilities & their infrastructure, and so forth. “Insurance” was very specifically tied to claims analysis and risk management, and insurance companies were usually the petitioners though there was at least one third party. Not only are there many other intended purposes other than photography, industrial inspections and surveying both exceed filmmaking and real estate exemptions granted. Let me say that again, the FAA 333 exemption data shows that more commercial operations are interested in inspection work that real estate photography work. The data also suggests something else – there are a lot of people quietly flying fixed wing UAVs. The public, media, and government often associates “drones” with multi-rotors. A lot of precision agriculture, mapping and SAR applications require fixed wing platforms for long duration, wide area operations. Put some public and media misconceptions to rest. The second point is very important to me – it is hard to make good decisions about regulation, law, investment, operations, etc., without good data to help inform the decision making process. Our raw data extracted from the 333 data set is available to academic institutions and media organizations at no cost providing that appropriate attribution is included in any resulting analysis or reporting. The following graphic was too large to include above.